Safety is a priority at nuclear power plants. Are safety hazards in nuclear power plants exaggerated? Would you work in or live near one? Let's consider the features that have been put into place to keep staff and the public safe. Nuclear power plants generate electricity by using steam to make large, propeller-shaped blades turn, spinning the shaft of the generator. Inside this huge structure, wire coils and magnetic fields combine to create electricity. Uranium is not burned during the process. Instead, heat is produced through fission (splitting an atom). The fuel used is in the form of a pellet, which is approximately half an inch long and the same diameter as a piece of blackboard chalk. 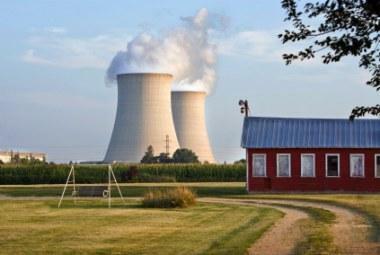 A nuclear power plant is a secure facility. These installations are continuously patrolled by security personnel. Access to the plant is controlled, and all visitors must sign in and out with a security guard. If a person is exposed to radiation at a nuclear power plant, taking a shower will remove the material from the hair and skin. In the case of a person who swallows or breathes in something that is radioactive will be contaminated until his or her body eliminates it or the material stops giving off radiation. Great care is taken when designing nuclear power plants to reduce the likelihood of an accidental release of radioactive materials. Containment buildings at a nuclear power plant are specially constructed to withstand natural disasters such as tornadoes, hurricanes and earthquakes. Reinforced concrete and steel are used to make them as strong as possible. A well-managed nuclear power plant has training programs in place to ensure that new hires are well prepared to do their work in the facility. The accident that took place at the nuclear power plant at Chernobyl in 1986 was caused by a design flaw in the reactor. This fact, combined with staff who were not properly trained, led to an explosion and fire that released a percentage of the plant's radioactive core into the atmosphere. Since that time, training has been improved at nuclear power plants to prevent a similar event from occurring. Companies operating nuclear power plants take steps to monitor levels of radiation at the plant itself and on the grounds. If a leak is detected, steps are immediately taken to find the source of the leak and contain it. The area where the leak occurred is monitored after the fact to confirm that the containment efforts were successful. Each year, nuclear power companies in the United States submit reports on radiation levels at the plant to the Nuclear Regulatory Commission (NRC), the agency responsible for regulating the industry. In the interests of public safety, U.S. nuclear power companies are required to inform authorities at the local, state, and federal levels any time there is an unplanned release of radiation from the plant, even if it is at a level below the threshold where it must be reported to the NRC. As long as facilities are run according to the regulations put in place with the NRC or other government agencies, the safety hazards in nuclear power plants are kept to a minimum.